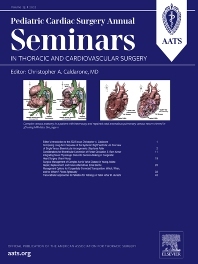 The Pediatric Cardiac Surgery Annual is a companion to Seminars in Thoracic and Cardiovascular Surgery. The Annual focuses on the most significant developments in pediatric cardiac surgery, providing coverage in new procedural and technological advances. Each annual volume contains submissions by prominent surgeons who presented their findings during the Post-Graduate Course of the AATS Annual Meeting from the previous year.